Hot pepper varieties can be divided into Southwestern Chiles, Ethnic Hot peppers, and Chiles for Drying. 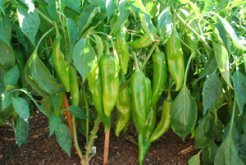 Southwestern hot pepper varieties range from the mild Anaheim style peppers to New Mexico green and poblano chiles, to the hotter geurro, jalapeno, and Serrano chiles. New Mexico green chiles are notoriously variable in their heat. Some years, they’re mild, some years, they’re scorchingly hot. 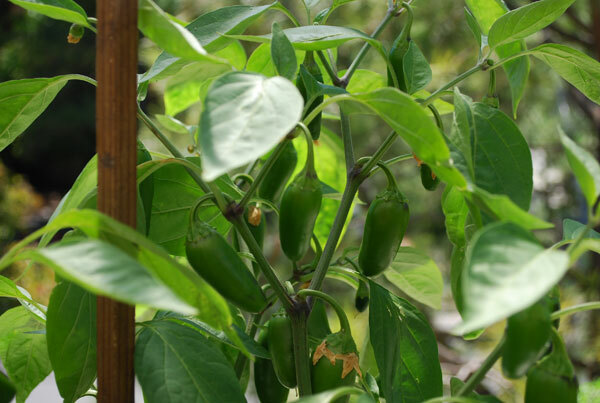 When growing hot peppers, summer heat often translates into chile heat. 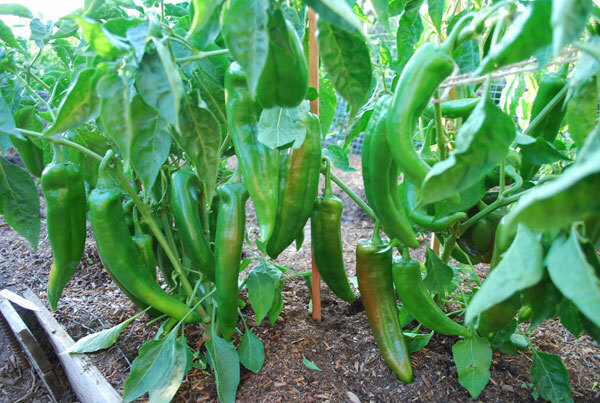 ‘Nu Mex Joe Parker’ (F1 hybrid, 70 days green, 95 days red) is the old standard Hatch Valley green chile that produces mild to moderately hot, 6-8” x 2” (15-20cm x 5cm), slightly flattened green chiles on sturdy, large plants. ‘Big Jim’ (F1 hybrid, 70 days green, 95 days red) produces heavy yields of large, 9-12” x 2” (22-30cm x 5cm) green chiles with mild to moderate heat. Prolific plants produce heavy yields. Poblanos are the classic dark green chile that’s used for chiles rellenos, but they also make a good green chile sauce, either on their own, or mixed in with New Mexico green chiles. They’re mild to moderately hot, and have a firm texture that remains al dente even after cooking. Some ripen to bright red, some to a deep, brick-red color. Ripe poblanos are called anchos, which are dried and ground for chile powder. ‘Mulato Isleno’ (Open pollinated, 76 days, to dark green, 95 days to brick-red ripe) produces dark green—almost black—thin-walled chiles that ripen to a dark chocolate color. Perfect for chile rellenos and moles. 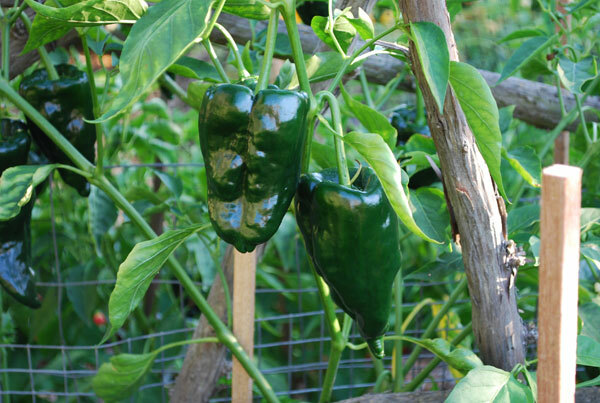 ‘Tiburon’ (F1 hybrid, 65 days green, 85 days red ripe) produces thicker-walled, lighter-green anchos on large, sturdy plants. Better for roasting, grilling, and green chiles. ‘Early Jalapeno’ (Open Pollinated, 60 days to green, 80 days to red ripe) is a reliable early producer, and the best choice for growing jalapenos in northern, cool, or short-summer gardens. 1” x 2-3” (2.5cm x 5-8cm) fruit. ‘Conchos’ (F1 hybrid, 65 days green, 85 days red). Large, vigorous plants produce heavy yields of 1 ½” x 3” (2.5cm x 8cm) jalapenos. 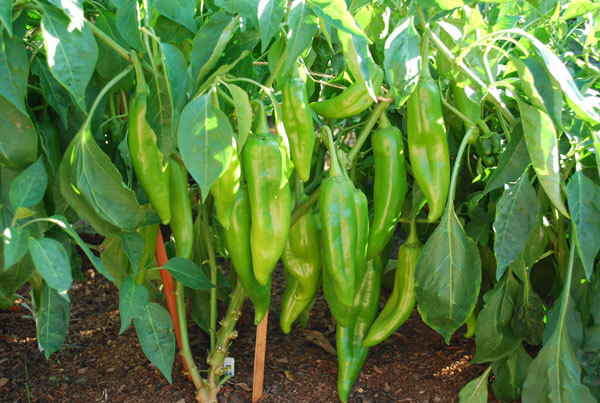 Most commercially grown jalapenos are ‘Conchos’. Serrano peppers are the finger-sized hot green chiles you see in supermarket bins, next to the jalapenos. They’re usually harvested green, at their hottest, and chopped into stir-fries and curries to add heat. ‘Serrano del Sol’ (F1 hybrid, 55 days green, 75 days red, resistant to PMV, PVY, TEV) is a large-fruited, 3-4” (7-10cm), early serrano chile. ‘Guerro’ (F1 hybrid, 65 days green, 85 days red) is one of my favorite hot pepper varieties. Large plants—up to 3 feet (1m) high and 2 feet (60cm) wide in a good raised garden bed—produce heavy yields of medium-hot, pale yellow chiles, 1 ½” x 3-4” (4cm x 7-10cm). They have a nice, gentle heat, intermediate between a jalapeno and Anaheim chile. ‘Bulgarian Carrot’ (Open pollinated, 70-80) produces clusters of 3-4” (7-10cm) fruit that ripen from green to orange. Strong, fruity overtones, with heat at the end. Great grilled, roasted, or in salsas or marinades. ‘Habanero’, a.k.a ‘Scotch Bonnet’ (F1 hybrid, 75 days green, 100 days to bright orange) produces small, 2” x 1 ¼” (5cm x 4.5cm) bonnet-shaped peppers that are blazingly hot, with fruity overtones. Used in Jamaican jerk spices. 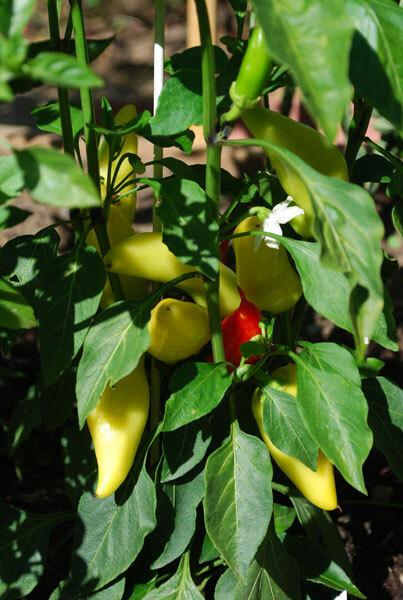 ‘Hot Paper Lanterns’ (F1 hybrid, 70 days to pale green, 90 days to red) is an early habanero that produces long, 3-4” (7-10cm) peppers that ripen from green to orange to red. Best habanero for northern, cool, or short-summer gardens. ‘Hungarian Hot Wax’ (F1 hybrid, 58 days to pale yellow, 83 days to red) produces long, 1 ½” x 6” (4cm x 15cm) peppers that are spicy, but not scorching hot. They ripen from yellow to bright orange to red. Traditionally pickled, they’re also great grilled. ‘Numex Twilight” (65 days purple, 85 days to ripe red) is a beautiful ornamental/edible chile that produces a profusion of upright chile clusters like Christmas lights. Chiles ripen from purple through pale yellow, orange, and red stages. Edible, but very hot. A great potted chile to give to friends with parrots. Many small, hot chiles are grown for drying, not for fresh use. The dried chiles are used whole in soups, stews, and stir-fries, to add heat. They can be crushed or ground for even more meat, and for dry rubs for meat, poultry, or fish. See Drying Chiles for more information. 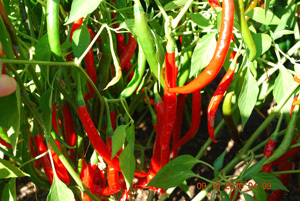 ‘Long Thin Cayenne’ (Open pollinated, 90 days) produces 4-6” (10-15cm) long curved fruit that ripen from green to red. Usually dried and ground fine to add heat to any dish. ‘Mirasol’ (F1, 65 days green, 85 days red) produces a profusion of long, thin chiles in upright clusters. They ripen from green to purple to pale yellow to bright red. 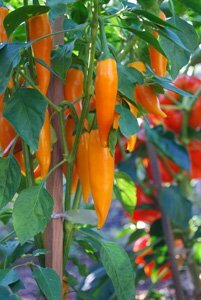 ‘Ascent’ (F1, 85 days) is a Thai hot pepper that produces a dozens of long, thin ½” x 2” (1cm x 5cm) chiles on large, stocky plants. They ripen from green to purple to bright red.